TOUCH OF CREATION: CardMaker Magazine - Inchie Arts Blog Hop!!! Welcome to CardMaker Magazine - Inchie Arts blog hop!!! If you are not familiar with Art Squares , you can check it out here. I'm using Inchie Arts art squares for the first time...this stuff is absolutely amazing. They are precision cut matboard in variety of sizes...like 1", 2" , 3" & 4". They are like mini canvases to me. The theme for the hop is FALL. As I mentioned its like a mini canvas. I stamped the card base using Hero Arts leaves stamp with white ink. Then created my focal art square. I used Gelatos and layer of stamping and stenciling for the background. Then added few diecut leaves( cut using Lawn Fawn dies and glitter paper, vellum and balsa wood). For my sentiment I used a flair. City Crafter Challenge - Leaves. Simon Says Stamp : Use Watercolors. Great Impressions - - Autumnal Elegance. 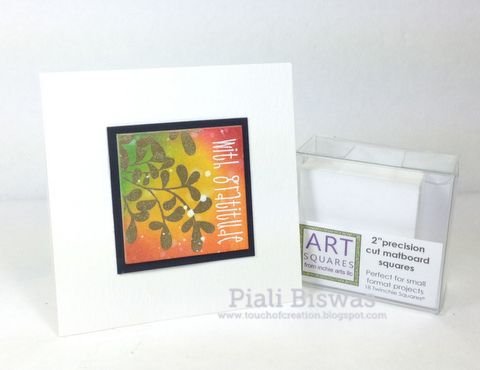 These 2" art squares were perfect for my 4 x 4 thank you card set. Clean and simple... just heat embossed the sentiment with white and various leaves with gold, then sponged some distress ink over it. Also added few white ink splatters. All stamps are from Paper Smooches. This card set will make a perfect gift!! Really these art squares are super fun to work with!!! For this card I heat embossed the background using Hero Arts stamp and white embossing powder. Then I heat embossed few inchies with the same stamp and white EP. Colored the Inchies with distress ink and waterbrush. Adhere them randomly on the cardfront. Added some gold splatters ,gold enamel dots & rhinestones. AAA - Play with watercolors. Stamping Sensations - Autumn Colors. Hope these projects inspire you try out these Art Squares from Inchie Arts! I love them...you will see many more projects using these on my blog in future. Hop along to see all the amazing creations and don't forget leave a comment on each stop. Inchie Art is hosting a great giveaway!! All of those cards are gorgeous pieces of art! Totally love them! Wow! Everything is just so beautiful! Beautiful cards..first one stunning ! Wow!! So many stunning projects I love them all. The gold leaf on the first just takes my breath away.. but I think the last is really clever with the embossed leaves and gold spray. Fantastic! Every project you did was amazing! Love the sparkle and gold accents! This is new to me too and I'm loving it. So easy to use and less waste. Love your cards. They are so pretty and colorful. really beautiful and that first one should be framed on a wall--artistic! Awesome cards. Really love that 4x4 gift set. I just bought some twinchies, so I'm looking forward to playing with those. Thanks for the inspiration! ...THUD! That's me, in jaw-dropped, breath-taken away awe at the stunning beauty of what you've created and shared with us here. Incredibly lovely and stunning! Perfect showcase for the pairing of images and inchies! I've never heard of art squares. Yours are breathtaking. I love the fall colors. Thanks for sharing all your beautiful projects. The backgrounds you created are stunning! All your projects were gorgeous...but I especially love the set of cards - simply elegant!! Beautiful cards, Piali! Looks like you enjoy autumn as much as I do! Thanks so much for sharing these with us at the Simon Says Stamp Wednesday challenge! You have used these inchies so beautifully! I love how rich and gorgeous against the black frame with the white card stock! So glad that you join the fun over Virginia’s View Clean and Simple Challenge! Gosh, your projects are so unique. How nice to have a handful of thank you notes on hand. Piali, you're been a busy girl! These are ALL super Fabulous! Drooling here. Honestly everthing on this post knocks me out. Incredible. You have certainly inspired me, haven't done any inches in years! These cards are gorgeous! Absolutely stunning Piali! Love the sponging and the design! All great designs and all so pretty. Especially like the thank you notes. Awesome cards. Love the first one so much Piali. Gorgeous colours with depth and richness! So glad you joined us at CASology this week! Especially love your first card! Delightful!! Seriously, they are all beautiful. I love your color use. 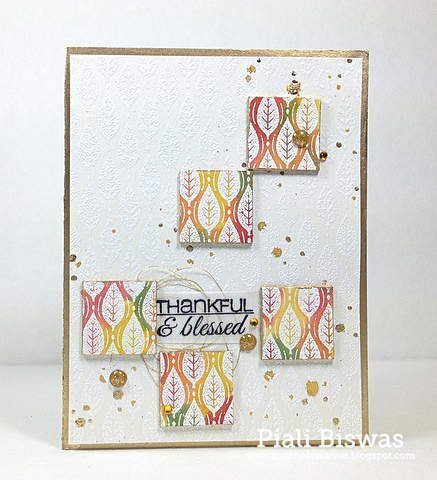 A beautiful fusion of Autumnal colours on your pretty cards Piali. My goodness these are all so beautiful!! Thanks so much for playing along at CCCB!! Beautiful cards Piali !! I have also become your latest blog follower ! So creative and fun. Beautiful fall colors and lovely creations. I love the "inches" card that you did with the heat embossing and distressed inks. Great CAS. Thanks so much for playing along with AAA Cards this week. Your cards are gorgeous. And I love your take on our challenge. Your first card is my favorite. Love that! Thank you so much for joining us at CCCB! Oh my gosh I am so inspired. I like how you heat embossed a background pattern on the same colored card stock for two projects. Love the detail of the mixed media card 1. Especially the aspen leaves in three types of materials. Love the 4" card set. But my fave is the last card. I like how you repeated the subtle background pattern in bold fall colors. Wow...thanks for all the inspiration! Gorgeous cards! Awesome colors and textures! Fall is my favorite time of year... beautiful leaf designs too, so perfect for fall creating! Your autumn inchies are gorgeous, and I love the embossed background. Thank you for sharing your lovely card with us at Stamping Sensations. PS. Your other cards are just as beautiful! Wow, what an amazing array of card! I am sold on Inchies now! I love all your beautiful creations! Oh my gosh, all of these cards are wonderful! I especially like how you used the gelatos and stencils on the first square. Your card set for fall is beautiful! And I love your last card as well. Awesome work!! Thanks for sharing. So beautiful!! Thank you for joining us at Great Impressions! Lovely! Thanks for joining us at Great Impressions.